The current structure of the system of passive labour market policies is the product of a number of important measures introduced between 2012 and 2015 (from the “Fornero” pension reform to the Jobs Act and the related implementing decrees) that profoundly reformed the overall design of the Italian labour market. This Focus Paper (in Italian) analyses these measures, which were intended to remedy the shortcomings of Italy’s social safety net and increase the resources dedicated to funding the system, thus closing Italy’s gap with the other main European countries. Historically, Italy’s social safety net has targeted employees with open-ended contracts, with some diversity and complexity across industries and categories. Outside this population, safety net coverage had been fragmented and ineffective. Until the reforms of 2012-2015, moreover, the various forms of passive and active labour market protection had seen their functional specificity eroded and had ended up overlapping not only with each other but also with other institutions of the welfare system designed to cover areas outside the workplace. The Fornero reform and the Jobs Act revived the specificity of public welfare institutions, reaffirming their nature as pure insurance mechanisms and underscoring the internal differences between unemployment protection tools and income support measures for the employed, a distinction that, especially in the aftermath of the 2008 crisis, had been attenuated as a result of their use in special cases or exceptional circumstances. The first group includes the new unemployment insurance scheme for payroll employees (NASPI), the agriculture benefit scheme for employees with agricultural duties and the unemployment benefit scheme for “para-subordinate” workers and certain related categories (DIS-COLL) (Figure 1). The second group includes the Ordinary Wage Supplementation Fund (CIGO), the Special Wage Supplementation Fund (CIGS) for payroll employment and the Agricultural Wage Supplementation Fund for payroll employees with permanent contracts assigned to agricultural duties (CISOA) (Figure 2). The rationalization and moderation of the value and duration of benefits and the establishment of less stringent seniority requirements that in the past has enabled the pool of beneficiaries to grow. Table 1 and Figure 3 report the most recent data on labour market safety net spending contained in the final accounts of the National Social Security Institute (INPS). In 2016 the largest item of expenditure was the NASPI (about €8 billion, €12 billion if figurative contributions are included), followed by CIGS (about €1.3 billion or €2.5 billion including figurative contributions). Overall, these two mechanisms represent about 70 per cent of spending on unemployment safety net mechanisms (about €13.6 billion, or nearly €21.4 billion including figurative contributions). 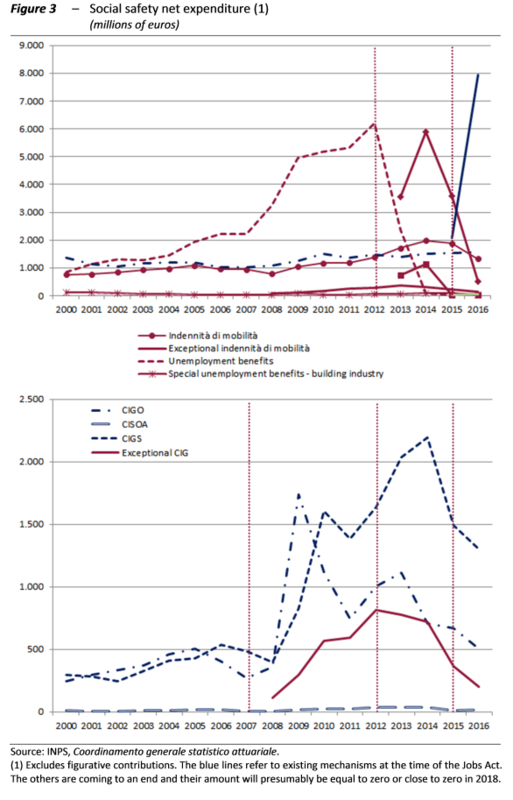 Looking at developments in spending over time, we find that the indennità di mobilità (a redundancy scheme) and unemployment benefits initially increased in the years immediately after the economic crisis (2008-2012), and then gradually decreased as the most acute effects of the crisis subsided and, above all, these two mechanisms were replaced, first with the ASPI and mini-ASPI schemes and then the NASPI mechanism. The same observation holds for the Wage Supplementation Funds. Turning to the beneficiaries, Table 2 shows that in 2016 more than 2 million people received NASPI benefits and the NASPI system covered the largest pool of beneficiaries, while the Wage Supplementation Funds (CIGO, CIGS and CISOA) provided benefits to a total of just under 690,000 workers. Examining the evolution in beneficiaries over time, we find signs ‑ as already noted for the expenditure side ‑ of the past economic crisis, with the number of beneficiaries of both income support and unemployment schemes reaching a peak in 2009-2010 before gradually declining. Although 2016 cannot yet be considered a year in which conditions had fully normalised, it is possible to compare data on expenditure and beneficiaries with the situation in 2007, when the economic crisis had not yet hit the Italian labour market. With regard to mechanisms for the unemployed, in 2016 more than €12 billion in resources went through the NASPI system in 2016, compared with some €7.5 billion allocated in 2007 to the indennità di mobilità (both ordinary and exceptional) and unemployment benefits (in their various versions: ordinary, agricultural and building industry). In addition, the over 2 million NASPI recipients in 2016 compare with about 1.8 million beneficiaries of mobilità benefits in 2007. With regard to the Wage Supplementation Funds, the more than €3.7 billion in resources dedicated in 2016 on an ordinary and exceptional basis to CIGO and CIGS far exceed the €1.4 billion in spending in 2007. In 2016 the Wage Supplementation Funds covered about 690,000 workers, while in 2007 the number of beneficiaries was about 565,000, with about 395 million hours indemnified in 2016 and 179 million hours in 2007. Overall, then, we find that the beneficiary pools now covered by the social safety net programmes are significantly larger than those covered by the benefit schemes available in the years immediately prior to the crisis. However, although there has been a recovery in recent years (Figure 4), spending on unemployment (net of severance benefits) remains lower in Italy than the average for other EU15 countries. According to Eurostat data on unemployment expenditure (SESPROS dataset) between 1995 and 2007, Italy’s spending was more than one percentage point of GDP lower than the average for the countries belonging to the EU15, and even lower than that if the comparison is made with France and Germany. 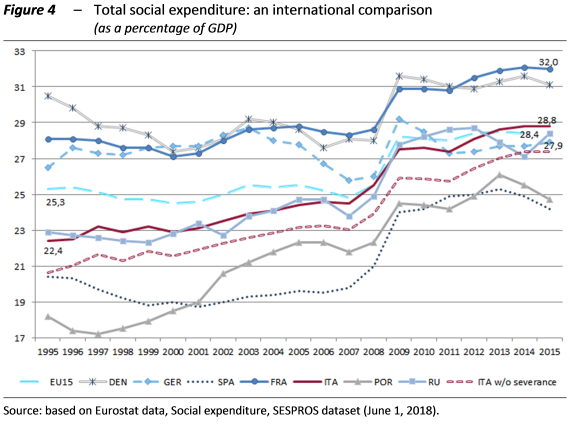 In the subsequent years, with the economic crisis and the exceptional application of social safety net mechanisms, Italian expenditure rises to 1.7 per cent of GDP, aligning it with the European average and exceeding that in Germany (which has been contracting since the mid-1990s). Considering expenditure net of severance benefits connected with job losses (0.97 per cent of GDP), Italy ‑ while approaching the EU15 average ‑ remains, together with the United Kingdom, the country with the lowest unemployment spending. Finally, in addition to reforming the public pillar of the social safety net, the Jobs Act introduced two major structural links. The first, completely absent previously, concerned the world of “bilateralism” (bipartite social dialogue); the second, only partially existing previously, concerned active labour market policies. The structural link between passive policies and active policies definitively completed a legislative process that had been under way for years. 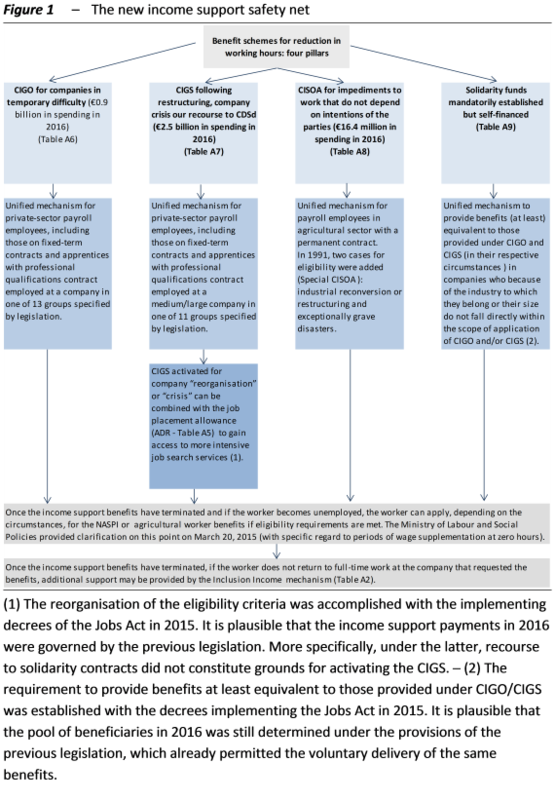 All benefits (including those of the solidarity funds) are now subject to compliance with the eligibility requirements, which for unemployment benefits also include acceptance of “appropriate” job offers, while for income support schemes they consist of participation in initiatives for human capital maintenance, retraining and orientation. The revised versions of the expansionary solidarity contracts and public service jobs, two other institutions that the Jobs Act has sought to revitalise, also contribute to linking the passive and active sides of labour market policies. The links with active policies have become extremely important. Within the new framework of passive mechanisms envisaged by the Jobs Act, the preservation of human capital, retraining and keeping human resources in the active population are essential elements for the proper functioning of the entire welfare system. In order to extend the safety net to broader pools of potential beneficiaries while ensuring the sustainability of expenditure, for individual beneficiaries the new benefit schemes have taken on the form and substance of a circumscribed “window of opportunity” which, precisely because of their reduced duration and amount compared with the past, must be put to good use to overcome employment difficulties and reacquire income-producing autonomy. However, if on paper the design of the links between passive and active policies today appears virtually complete and sufficiently detailed, the entire active policy “machine” (institutions, tools, governance, resource planning, etc.) still has to be broken in and demonstrate that it can perform the important systemic functions it has inherited. 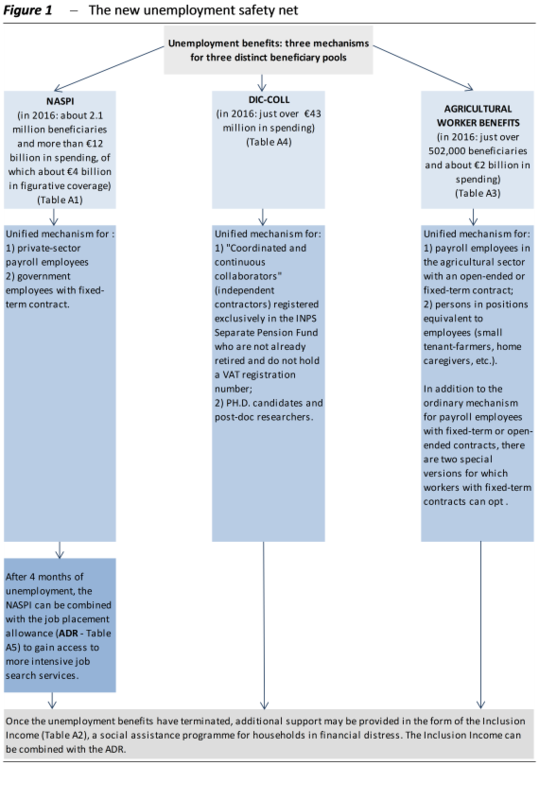 The Focus Paper, while not deepening its examination of active policies, finds that while major elements remain to be completed, beginning with the full operation of the National Agency for Active Labour Policies (ANPAL) and its relations with the regions and service providers, certain institutions connecting passive and active employment policies (from the expansionary solidarity contracts to new public service jobs, the job placement allowance and the Inclusion Income) are still in the experimental phase. The effectiveness of active policies is, so far, the greatest unknown about the success of the new labour-market welfare system. International comparisons show that Italy, even after the progress of recent years, still devotes fewer resources than its main partners, with the clearest shortcomings regarding labour market services as part of active policies, to which a very modest percentage of GDP (0.04%) is dedicated, one of the lowest levels in Europe. The challenge is now to ensure that the new passive protection mechanisms remain fully operational and, above all, to improve the quality and effectiveness of active policies by dedicating adequate and permanent resources to their range of functions.